The Brixton Pound, Lewes Pound, Bristol Pound and Exeter Pound are so-called community currencies. They look like banknotes, but they are not legal tender. Unlike banknotes from Scotland and Northern Ireland, community currency notes are not issued by a bank that is authorised by the Bank of England. Technically these local currencies are not banknotes but vouchers. Individuals and businesses are not obliged to accept them as a means of payment. So what’s the point of having them? And if you have a community banknote, what can you do with it? Why have a local currency? Community currencies in the UK originate from an initiative known as the Transition Network that began in 2006. This is a collection of grassroot community projects with the aim of increasing the resilience and sustainability of communities, particularly with regard to their food and energy needs. 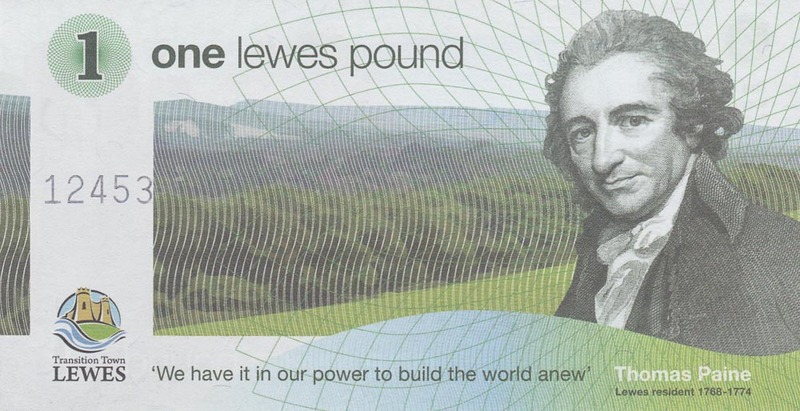 The first local currency in the UK was the Totnes Pound, launched in 2007. The idea behind having a local currency is that money spent locally stays within the local community. Community currencies promote trade between local businesses and suppliers, and allow consumers to support and strengthen their local economy by choosing to use a local currency that only has value within their community. The Kingston Pound website estimates that between 80 and 90% of money spent with normal banknotes leaves the borough within a day. But when the money is a community currency that only has value locally, all of the money spent remains within the local economy, effectively becoming an investment in the local area. These local currencies are complementary currencies, meaning that each £ of local currency in circulation is backed by £1 Sterling held in deposit by the community interest companies (CICs) that issue the local currency notes. Local businesses agree to accept the community currency notes in exchange for goods and services. For individuals and businesses, buying and selling with community currency ensures that money spent locally stays within the community. Unlike normal money, community banknotes have an expiry date. This encourages people to spend the money, rather than keeping it. Only businesses who are part of the local currency scheme can exchange the notes for pounds Sterling. Individuals who receive the local notes as payment or as change redeem their value by spending them again with another local business. No, there is a significant amount of business conducted using Community Currencies. The Bristol Pound is one of the most successful local currencies. Since its launch in 2012, more than £5 million Bristol Pounds have been spent. Bristolians can use their £BP (Bristol Pounds) to pay for train and bus journeys, or to buy goods and services from local shops. In addition it is also possible to pay the Bristol council tax in £BP. What can I do with a local banknote if I'm not local? It is difficult to spend a community banknote unless you buy a product or service from a local business. However, that does not mean that an Exeter Pound is worthless outside of Exeter. Many of the community banknotes are wanted by collectors. Notes in good condition can sell for a premium. But be aware that community banknotes have an expiry date. Once the expiration date has passed, the local banknotes become de facto worthless and this makes the selling price on auction sites like Ebay unpredictable in the long run. As a general rule you should not accept payment or change in a local currency unless you know how and where to spend these banknotes.